Conor Walsh’s lab is designing a robotic “exosuit” to aid human movement; soft and lightweight, it can be worn under clothes. The actuator box, carried in the wearer's backpack, provides well-timed bursts of power that are transmitted to exosuit components strapped at the user's knee and ankle joints. A soft robotic glove intended for hand rehabilitation therapy uses fluid-powered elastic tubes to mimic finger movements. [extra:Extra] Watch a video of researchers demonstrating the soft robotic exosuit. “Robot” suggests constructions of synthetics and steel, from enormous machines on factory floors to the Roombas that vacuum floors at home. But assistant professor of mechanical and biomedical engineering Conor Walsh has a different kind of robot in development. Walsh, a core faculty member at the Wyss Institute for Biologically Inspired Engineering, is creating soft robots designed to aid human movement; they are light, efficient, and built into the fabric of clothes. In one project, funded by the Defense Advanced Research Projects Agency, Walsh’s group and collaborators are designing a robotic exosuit to improve the endurance of soldiers, who routinely carry heavy packs. The invention may also help patients with motor impairments, who often have difficulty walking. The idea of a wearable robot is not itself new, but previous versions were known as “exoskeletons,” because they typically used rigid outer frames for support. That design, Walsh notes, can compromise the very purpose of the suits: their restrictive machinery and large battery packs only add to the load. The lab has produced an adjustable suit made of nylon, polyester, and spandex that is strapped snugly around the user’s hips and thighs and connects to boots at the heel. When the wearer walks, sensors embedded in the insoles send a signal that is relayed up the body to an actuator box, which can be clipped onto a backpack or waist belt. 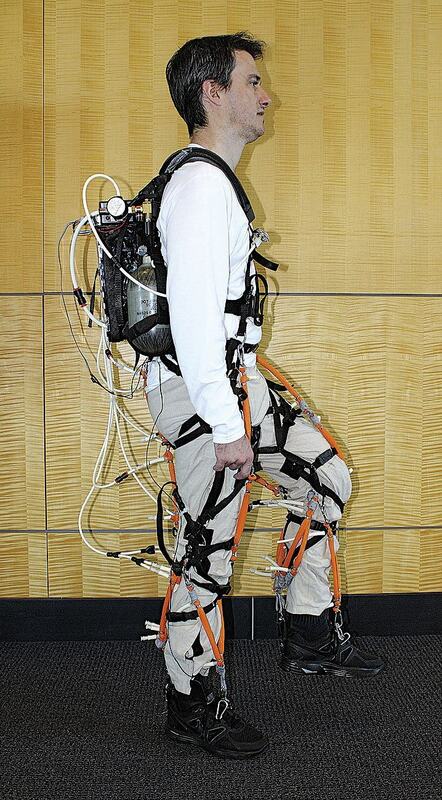 A computer processor tracking the user’s gait tugs (using motors and pulleys) on cables strapped at the hips and ankles to provide well-timed bursts of power, thus reducing the energy needed for walking. “We’re not trying to make sure that we carefully move the leg to a precise position,” Walsh says. 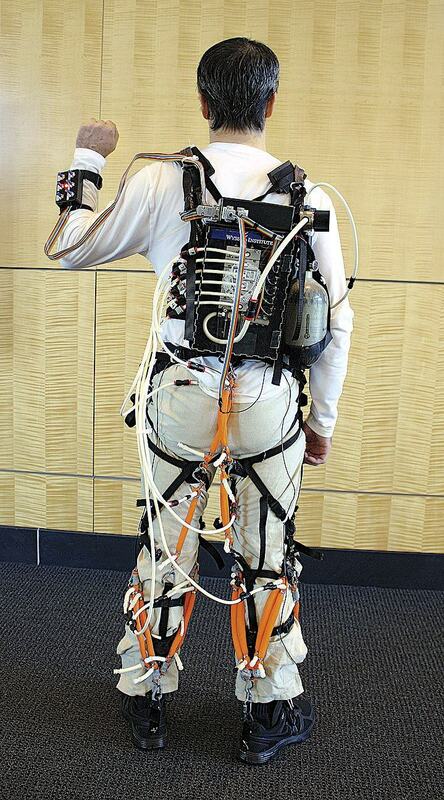 “Rather, we just want to give a little kick or burst at the right time.” The exosuit currently runs on approximately 50 watts of continuous power and can operate for four hours; its components—suit, actuator, and battery—weigh six kilograms (about 13 pounds) altogether, nearly all carried around the waist. 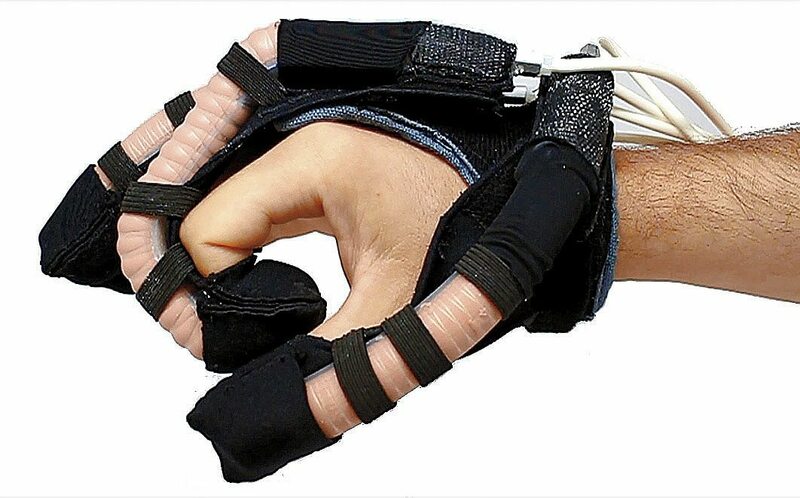 In another application of soft robotics, Walsh’s team is also designing a fluid-powered glove for hand rehabilitation. Rather than use pulleys and cables, as in the exosuit, the researchers designed silicon-based inflatable tubes to mimic the motion of fingers. By wrapping the hollow elastic in thin fibers, they could control how the material stretched and curved when air or water was pumped into the tubes. That way, the material itself assumes the correct shape when pressurized, eliminating the need for complex mechanisms and control systems to recapitulate hand movements. “One of the advantages of these types of soft robots,” says Walsh, “is that you can design complexity into the structure to simplify the control requirements.” He imagines that the robotic glove could supplement physical-therapy exercises, aiding patients who have difficulties with motor control. So far, the soft robots have been tested extensively on healthy people, and Walsh’s group is now beginning work with clinical partners to determine whether the glove and exosuit can help patients with disabilities. In the meantime, the team continues to refine its inventions. One major goal is improving the exosuit’s ability to monitor the wearer’s gait and accurately time its responses by embedding sensors along the length of the leg, rather than in the boot alone. The lab is also testing how the exosuit responds when the user travels over rough terrain, or walks at varying speeds.